Red Dead-nettle, Lamium purpureum, East Sussex, April. Photo: Paul Kirtley. Red Dead-nettle, Lamium purpureum, is a common plant of country tracks and hedgerows. It is often found on or near farmland and sometimes described as an arable weed. Similar to other dead-nettles it has toothed, heart-shaped leaves. Red Dead-nettle, however, bears much less resemblance to its namesake Stinging Nettle, Urtica diocia, than White Dead-nettle does. The leaves of Red Dead-nettle often have a purple-grey tinge to them. The stem has a square cross-section and the plant grows to a height of around 20-25cm. The upper-most leaves can become a deep purple-red when the plant grows in areas where it is more exposed to strong sunlight. The plant flowers from March to October and the flowers are a pink-purple colour. The flowers and leaves of the Red Dead-nettle are concentrated towards the top of the stem. Noticing this concentrated grouping helps us differentiate between Red Dead-nettle and similar species of dead-nettles. The much less common Henbit Dead-nettle, Lamium amplexicaule, has leaf/flower clusters more spaced out along its stem. The leaves of Henbit Dead-nettle are also much more rounded and clasp the stem, seeming to form a green disc around the stem. Cut-leaved Dead-nettle, Lamium hybridum, has leaves that are generally a little narrower than Red Dead-nettle and they are more deeply toothed (hence the name ‘Cut-leaved’). 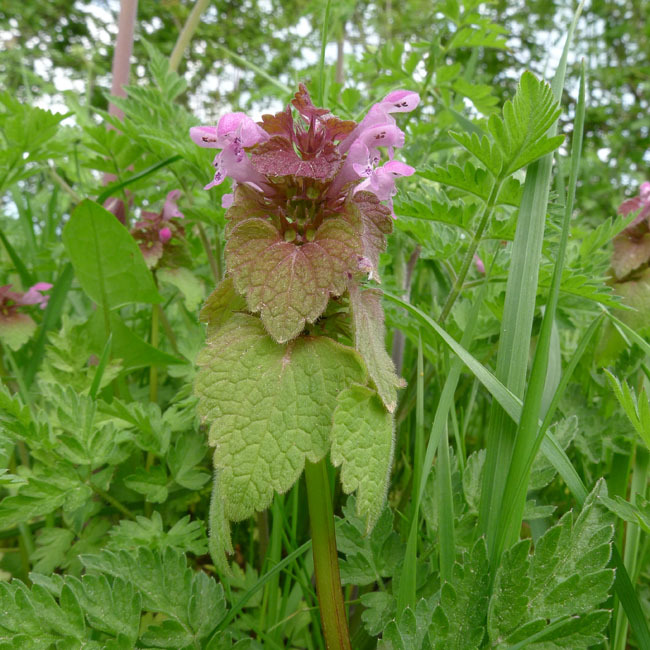 The flowers and leaves of Red Dead-nettle, Lamium purpureum, are concentrated at the top of the stem. Note also the square stem. Photo: Paul Kirtley. 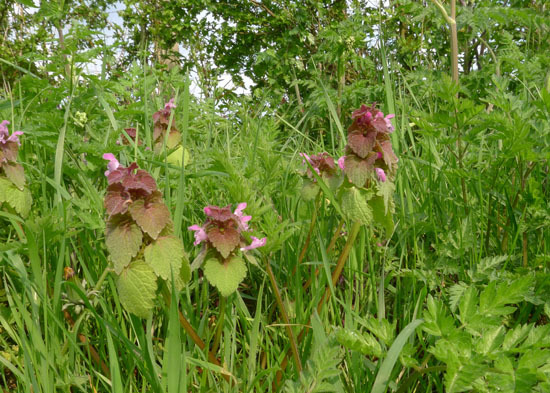 Red Dead-nettle is edible (as are the similar species mentioned above). You can use Red Dead-nettle as per White Dead-nettle, Lamium album and the leaves and flowering tops are great in salads. Unlike White Dead-nettle, there doesn’t seem to be the tendency for the leaves to become bitter with age. So you can use Red Dead-nettle as a salad ingredient as long as the leaves are available. hey paul, great article, keep em comin! just out of curiosity, greater reed maize pollen, just tap the head into a bag?? For collecting the pollen of Greater Reedmace, Typha latifolia, yes tap the head into a plastic bag. The pollen is a wonderful yellow colour and added to flour makes a great flavoured bannock. I’m really enjoying these edible wild plant articles Paul. I’d also like to say how much I appreciate your photographs which make all the difference. Great stuff. Nice to hear from you – it’s been a while. Thanks for your feedback – it’s good to hear my articles are proving useful. I live on an island in western wash. state. Lots of wild “weeds” I am interested in learning about edible and inedible native weeds. It is hard to identify just by looking at pic. and wondered if you could advise me. Discovered I have lots of red dead nettle and also nettle. Great article. These were introduced to North America from the UK. They now can be found in the eastern Canadian Provinces from Ontario eastward, and in British Columbia, but not in the Prairies. Hope to try them some day when I get back to Ontario from Alberta. Great to come across your blog whilst trying to identify this growing abundantly in my garden (next to arable fields). Really helpful and informative. Presumably a useful plant for insects? Many thanks – I’ll be back!